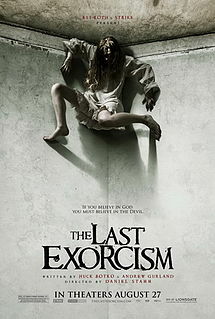 I heard pretty mixed reviews of The Last Exorcism when it came out. Now that I've seen it, though, I feel like it was a pretty solid movie. I'm a little worn out with the found footage school of horror films, but staging it as a documentary worked for me, too. The main character of The Last Exorcism is the Reverend Cotton Marcus, a charismatic preacher from Louisiana who makes some money on the side performing exorcisms. Because of events in his own life, though, he has started questioning his own relationship with God, and no longer actually believes in demons. He's allowed a documentary crew to follow him, because he wants to expose exorcism as a fraud. When Marcus receives a letter that he says is pretty typical of the exorcism requests that he usually receives, he and the film crew make plans to travel to a farm where the letter writer lives. The man, Louis Sweetzer, is a widower who lives with his teenaged son and daughter. Since his wife's death, he's been especially protective of them, isolating his daughter from the outside world. Strange animal deaths have been happening on their farm, and it appears that his daughter Nell is responsible, although she has no memory of the events. Louis believes that she is possessed. Although Marcus doesn't believe in demons, he believes that some people are afflicted with mental conditions that are helped by the belief that a demon has left them. Because he suspects this is the case with Nell, he agrees to perform the exorcism, while letting the film crew observe the trickery that is a part of his performance. Following the exorcism, though, Nell's problems only grow worse, and... Actually, I think that's where I'm going to stop giving you details. I'll just say that Marcus is faced with something that he definitely has not seen before and not everybody is who they appear to be. Here's what really interests me: there are many themes in horror that get revisited fairly often, but none with less variation than exorcism. The spirits in a haunted house may be scorned lovers or lost children. A serial killer can have a mind that's been warped by anything from a brain tumor to an abusive mom. But think of every exorcism movie you've seen. The Exorcist. The Exorcism of Emily Rose. The Rite. Anneliese. They all have something in common. You don't even have to have seen all of them to know what it is - any two will be enough to let you see the pattern. Are you with me yet? In every one of these movies, the possessed individual is a girl or young woman. The movie always makes sure to show us that the girl is an innocent, maybe even a devout Christian. The rest of the story usually follows a pretty similar template once the priest shows up, but it's the part that I've just discussed that I'm stuck on. The thing about these movies that frightens us is not necessarily the demons that possess people. In fact, I'll bet most people share the beliefs of Reverend Marcus, and either don't believe in demons or are uncertain of their existence. What frightens us is the image of innocence defiled, the inability to protect somebody vulnerable, sweet, and beautiful from something evil. There's probably a whole paper in gender studies that could be written on this, but my stupid little blog isn't really the place for it. So, yeah, The Last Exorcism lifts some beats from its forebears in the genre, but it does it in a way that kept me entertained, and it hit me with an ending that I didn't expect. I give it four grimoires out of five. Tomorrow night: To the Devil a Daughter, available on Netflix instant streaming.